Mr. Didier Robert, President of Reunion, last week addressed islanders through a statement diffused through every means available in a bid to see a return to normality. 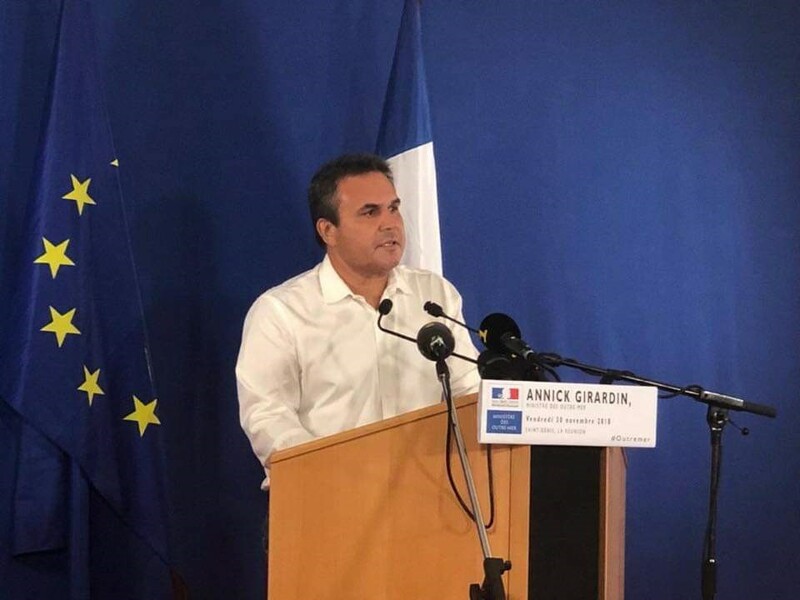 On the 11th day of the events launched by the Yellow Vests, La Réunion’s economy is suffering from the blow of a paralysis of unprecedented level, with very heavy impacts, that each one has measured in his own way, and for which we must collectively bring solutions. A quick return to “normality” must be found. It is imperative for dialogue and negotiation. The first meetings were initiated with the Prefect at the request of the Yellow Vests who have, from the outset, expressed the wish not to associate politics, trade union or religious representatives and to organize the next negotiations with the French Minister for Overseas Territories . For my part, for 11 days I worked with the regional advisers, in connection with the actors in the field of vocational training, the associative world, economic actors in the same spirit of construction and in search of solutions. The Réunion Region will fully assume its responsibilities, as we have always done, in all circumstances and on all matters that fall within its direct competence and that, shared with the State and other local authorities. Personally, as a politician, I have always acted with the concern of the general interest and in compliance with the law: support investment and support companies in the service of activity and employment ; and support also a policy for more equal opportunities. But my actions will not have helped to respond to the distress of all Reunion. I recognize this in all humility. But today everyone will also have to know how to act at their level of responsibility. For the time being, all of us must be ready to dialogue and plan reconstruction. For our island, the answers must be strong on both the immediate issues of employment and purchasing power. The answers must inevitably result in new methods, a new model to ask and to build. A model that takes into account this popular Reunionais expression. A model that takes into account the mistakes of the past. A model that feeds on the strengths of our territory, the qualities and aspirations of all the women and men who make our Reunion Island. I welcome the first initiative of Annick GIRARDIN, Minister for Overseas Territories, on behalf of the State, on the announcement and the immediate implementation of the reduction in the price of fuel, effective since this morning by Order of the Prefet. With regard to the region’s share of responsibility, I announced last week the freeze on the fuel tax increase for the next three years; a tax that I voted with a majority of those elected in Plenary Assembly because I also believe in the need to respond to the urgency of the energy transition. I specify that for the implementation of the new freeze measures, we will of course take into account, the return to the tariff of 2017 to erase any increase in fuel tax for all Reunion. I would also remind you that for the Region, this tax was earmarked for financing the maintenance and modernization of the road network throughout the island. I would like to remind you that the revenue from this fuel tax is distributed among all the local authorities: Region 117 million, Communes 55.7 million, Department 42.9 million, EPCI 5.4 million. (digits 201). I want to address today all those who are worried about the post-crisis, who are worried about the means of the reconstruction of Reunion and of our economy. I have spent the last few days exchanging ideas, listening, meeting and sharing with artisans, small traders, members of the liberal professions, taxis, ambulances, physiotherapists, nurses, farmers, cultural actors, with representatives the main professional organizations, with mothers and fathers, agents and employees of the public and private sectors … We exchanged on this historic crisis for our island, on the consequences of the paralysis of our economy for 10 days and on the means that can be devoted to reconstruction. The repercussion is already heavy, and the figures will be communicated very quickly to the Minister for Overseas Territories. In particular, there are proposals initiated by small businesses to save their work tools and jobs which will have to be quickly examined. I want to reassure the economic actors, the small and the very small entrepreneurs, the living forces of our territory, the associative leaders … I want to tell them of our total mobilization is by their side. We will have to face together, with the State of course, with all the local authorities, with all those who will be willing to mobilize, to this necessary effort which must be exceptional and immediate. The measures that will be proposed must meet the expectations and challenges for our island. In the end, it is the Reunionais who will have to choose their destiny.